The extraordinary Roman cavalry helmet, found by an as yet unnamed metal detectorist near Crosby Garrett in Cumbria in May 2010 – and now in a private collection, is to go back on public display for summer 2017. The Crosby Garrett Helmet and other equally unique Roman cavalry objects will form part of an exhibition covering the full 150 miles of Hadrian’s Wall, from Maryport in the west to South Shields in the east. 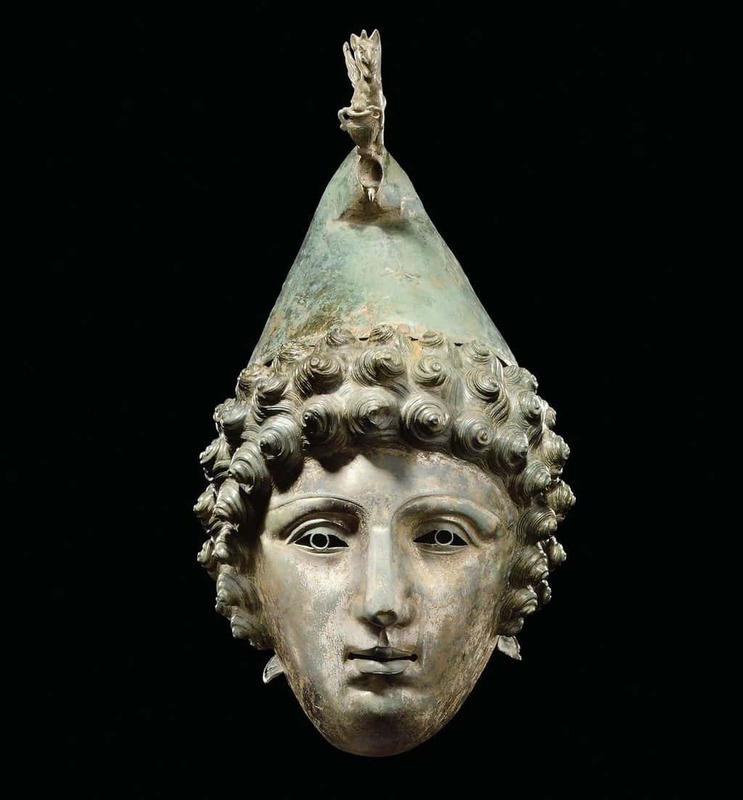 The so-called Crosby Garrett helmet, a bronze Roman cavalry helmet dating to around the 1st-2nd century AD and now in a private collection. The Crosby Garrett Helmet is widely considered to be one of the finest archaeological finds in Britain. This exquisite and unique example of a Roman cavalry helmet was found in May 2010 near the Cumbrian village of Crosby Garrett by a metal detectorist. Not, however, as the stunning artefact we see today. Rather, what was found were 67 fragments that the detectorist initially thought was a Victorian object. The helmet had been folded, and placed onto two stone slabs at the bottom of a pit, which was then covered with soil and capped with another stone. Following 240 hours of restoration by an independent conservator and restorer, we have an almost complete example of a two-piece Roman cavalry helmet. 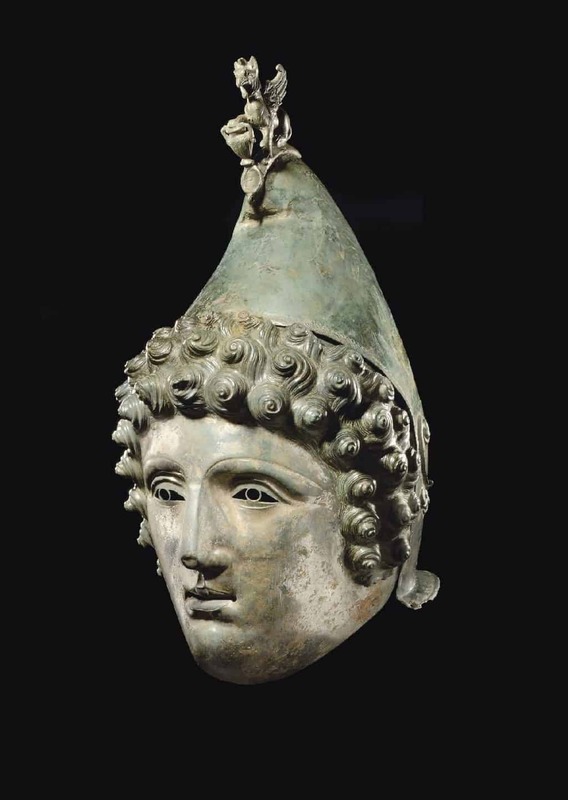 The headpiece is the shape of a Phrygian cap, a type of hat frequently used by Roman artists and craftspeople to identify the wearer as a Trojan. A winged griffin stands of the crest, depicted with a raised foot resting on an amphora. The separate visor portrays the face of a youthful, clean-shaven male with curly hair. Some suggest that the face depicts Paris, the youngest of the princes of Troy. When the Romans re-enacted cavalry tournaments or turma events known as Hippika Gymnasia, or ‘horse games’, they often acted out the exploits of the Trojans. This choice of Trojan iconography on the Crosby Garrett Helmet suggests it was used for one such turma event. Although the helmet passed quite legitimately at auction into private ownership, the owner has facilitated its display in three exhibitions. In 2017, it will be one of a number of important Roman cavalry helmets on display as part of celebrations across Hadrian’s Wall to celebrate the 30th anniversary of the Wall being added to the UNESCO list of World Heritage Sites. The Crosby Garrett Helmet will be on display in the Tullie House Museum and Art Gallery from 8 April 2017. Hadrian’s Cavalry is an exhibition and programme of events that takes place at 10 museums and heritage attractions along Hadrian’s Wall from 8 April to 10 September 2017. These include Roman Cavalry helmets that have been loaned by national and international museums (National Museums Scotland, the Musee d’Art Classique de Mougins, Archäologisches Landesmuseum Baden-Württemberg – Limes Museum, the Archaeological State Collection in Munich and the Landesmuseum Württemberg in Stuttgart). Two Ribchester style helmets will be displayed together for the very first time at the Great North Museum: Hancock, a complete Butzbach style helmet which will be displayed at Segedunum, and a helmet from the Roman fort at Newstead in Scotland can be seen at Vindolanda. Bill Griffiths, head of programmes for Tyne & Wear Archives & Museums and chair of the Hadrian’s Cavalry steering group, said: “The inclusion of the Crosby Garrett helmet alongside other unique objects from so many different museums across Europe really emphasises that the Hadrian’s Cavalry exhibition is a once in a lifetime experience. In addition to the wall-wide exhibition, Bitts Park in Carlisle will host two days of Roman cavalry re-enactments on 1 and 2 July, where 30 Roman cavalrymen will come together for the first time in almost 2,000 years for Turma! Hadrian’s Cavalry Charge in Carlisle.